Dave - We're talking about graphene this week, so to get a bit of background on what graphene is and how it was first discovered, I met up with Meera in an engineering lab at Cambridge University. Meera - This week on Naked Engineering, Dave and I have come along to the CAPE building which is part of the engineering department here in Cambridge, and we're here to learn all about graphene. Now to start things off Dave, what really is graphene? Dave - Well I'll start off with something much more every day, it's a pencil. Down the centre of a pencil, you've got what people call the pencil lead, but it isn't made out of lead. It's actually made out of graphite. This is a form of carbon and when you write with the pencil, it comes off and leaves a mark on the page. A part of the reason why it writes so well is that graphite is very, very slippery. This is because it's made of lots and lots of layers, all piled up, and the layers themselves are very strong, but the bonds between the layers are quite weak, so they can slip past one another and it's a really good lubricant. Now graphite has been around for hundreds of years, people have known about it, people made pencils out of it. It was only recently that people realised you can actually take one of these layers, a single atom thick, and separate it, and that's called graphene. Meera - And well, one of the places where this graphene is being made is here in this clean room, and it's being made by Andrea Ferrari who's a reader in nanotechnology, and his team here in the engineering department. Andrea - What is special about graphene is - there are two main things. The first one is it's a truly 2 dimensional material. We had nanotubes before, nanotubes were rolled up graphene sheets. It was quite unexpected to have a single layer and for it to be stable. The second thing that is very special about graphene is the combination of electrical and electronic properties. So the electrons of graphene behave as massless particles which means that we can have a huge mobility and extremely good electronic properties compared to any conventional semi-conductors and the second part is the optical properties that even being a single atom thick, a single layer of graphene can be seen by eye and absorb 2.2% of light. Andrea - Yes. The first method we are going to see is the one that was originally developed at the University of Manchester by Andre Geim and Konstantin Novoselov and this simply consists of taking a piece of graphite, a piece of tape and peeling it off until you get a single layer, and Antonio is going to show you how to do it. Antonio - Okay, I'm going to take one of these small pieces of graphite. I'm going to put them on top of some sticky tape. I'll use another piece of tape, just to clean, in a way, the surface of graphite many times until I get a nice and uniform distribution. So once I'm happy with the graphite on top of the tape, I just take one of these small silicon chips. These are covered in 300 nanometres of silicon oxide. Once we put the silicon substrate on top of the tape, there is some interaction between the top layer of the graphite and the silicon surface. At the end of the process, we have many different layers. This part is just one single atom thick. Dave - And it's just a remarkably simple process which - you could literally do this at home if you had a piece of tape and a lump of graphite! Meera - So now, having found out how graphene could actually be isolated, we've now come out to find out ways that it can actually be used. So we've come to one of the optical laboratories, still here in the CAPE building. And so Andrea, what are some of the applications of graphene? Andrea - Clearly, the first thing that people thought about was traditional electronics, replacing transistors and this may come in the near future. However, we are focusing here on applications that may come in the next few years, maybe three to five years, and one is for example, flexible electronics. So we can integrate graphene with plastic to make transparent and conductive materials that can substitute screens in laptops, and so on. Dave - So because graphene is so thin, it's a very flexible material. Andrea - Absolutely. 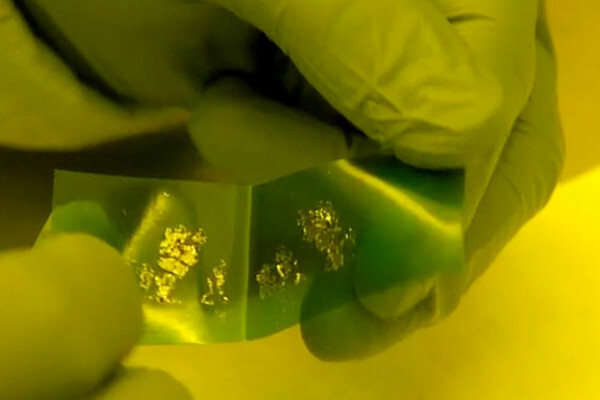 Graphene is extremely flexible, it doesn't break. I guess if you take a piece of silicon and you flex it, you will break it. Graphene will never break. In fact, in plane, graphene is stronger than diamond. But still, it maintains the exceptional electronic and optical properties at the same time. So that's why it's an ideal material for flexible electronics. Meera - Well you've got an example of one of your flexible electronics here in front of us. It looks like a piece of plastic really, about 8 centimetres squared. Andrea - It is in fact a piece of plastic. Actually, two pieces of plastic and we put graphene on the top of it, and in between them, some liquid crystals. We use graphene because it's conductive, plastic is not. We apply voltage to the graphene and the graphene switches the liquid crystal on and off, and lets light through. Dave - So the graphene on the two pieces of plastic is essentially attached to a battery of some kind. The two layers of graphene are applying quite a large voltage of the liquid crystal in the middle which is changing its optical behaviour entirely. Andrea - And in fact, the plastic is just there as a container for the liquid crystal. It does nothing at all. Meera - So at the moment then, it's a bit misty and it's placed over some writing on a piece of paper. You can't quite read the writing because of the misty screen. Andrea - Now, we're going to apply the voltage and the writing will appear. Meera - Yup! It's very clear. Andrea - Yeah, it's very clear. It will become a completely clear window and in fact, utilising slightly different technology, we can also freeze it. So it's quite possible to freeze it on or freeze it off and that's what you would want in the screen of your office, or in a car, or something like that. On the other hand, if we actually put more contacts and put smaller squares, we can make a display, and we can display an image there, and change the image with time. Meera - What makes this better than what's currently perhaps being developed or even in use? Andrea - Currently, in all displays in televisions and in laptops, you use ITO which is Indium Tin Oxide or some similar material. These are becoming very expensive. In fact, most of the cost of a laptop is in the screen itself. And also, there's another very obvious implication that if you take your laptop and you bend it, it breaks. On the other hand, this one is made of plastic with graphene on the top. Graphene never breaks and so, it's flexible and works. Meera - So how far away are we from actually seeing these screens in use? Andrea - You see that here, with a team of just a few people, a collaboration between two groups, we can make already quite large bendable screens. In the same time, in Korea, Samsung has made larger screens based on a slightly different concept. And so, the prototypes are already here and I believe that in the next year or so, there will be already some prototype mobile phone based on this screen, and then the real question is, will this go to market? And unfortunately, that's something that I cannot answer. You need to ask a company about that. Dave - That was Andrea Ferrari and Antonio Lombardo, explaining how graphene can be made using graphite and sticky tape, as well as demonstrating proof of principle that it could make really good flexible screens. a video of this sticky tape method in action. Dave - And Naked Engineering is supported by an Ingenious grant from the Royal Academy of Engineering.